Established in the year 2001, we, Zeen Enterprises, are one of the glorious manufacturers and exporters of an unlimited compilation of Packaging Inks. Our product range encompasses Flexible Packaging Ink, Extrusion Lamination Inks and Reverse Printing Inks that are made available in different packaging quantities to cater to the diversified requirements of our esteemed customers. Processed using quality grade ingredients, our product compilation is acknowledged for its longer shelf life, accurate composition, good consistency, vibrant colors, excellent printability and clear gradation. We are backed by an excellent infrastructure facility that is equipped with different kinds of machines and equipment that are based on advance & modern technology. Moreover, we have recruited a team of experienced, skilled and hardworking professionals, who are well trained to understand and cater to the exact demands of our patrons. Because of our sincere efforts, we have marked our presence all over the globe and captured the markets of Africa, Middle East, Asia and Europe. In the future, we aim to preserve the status and repute of our company. We practice transparency and ethics in our business dealings. Under the incomparable leadership of Mr. Mitesh Shah and Ms. Karishma Shah, we have earned a strong position in the business. With the constant motivation and regular guidance of our mentors, we get inspiration to perform better and maintain the impressive record of accomplishment that we have gained in the business. Our company recruits all the professionals on the grounds of years of experience in the market, educational qualification and technical knowledge. We are backed by an efficient workforce of chemical experts, technicians, quality analysts, administrative staff members, sales & marketing professionals and warehouse & packaging experts, who work in complete co-ordination to accomplish the organizational objectives. To enhance the skills of our team members, different trainings, workshops and seminars are conducted on a regular basis. Our workspace is set up with efficient machines, tools and equipment that support us with the obstruction-free operations of manufacture, storage and loading & un-loading. Our spacious infrastructure is managed by a team of professionals, who perform multiple up gradations on the systems, on a regular basis. Manufacture, quality control, administrative, warehouse & packaging and sales & marketing are some of the sections that our infrastructure has been divided into. Our magnificent infrastructure facility is one of the prominent causes of our name in the business. Maintaining the quality standards is one of the major priorities of our company. To keep up with the quality standards, we make use of premium quality ingredients, which are procured from our reliable and dependable vendors. Furthermore, we follow the predefined industry standards and norms, to achieve the greatest quality mark. Provided in tamper proof packaging, our product assemblage is free from contaminants. Delivering the best quality possible is our major aim, which we wish to fulfill in upcoming years as well. 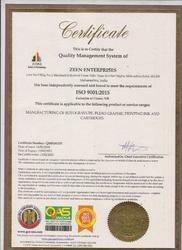 Zeen Enterprises is one of the preferred choices of our esteemed customers. Since the very beginning, we have focused on proffering the varied quality requirements demanded in the business. Our purchasers place immense trust in our abilities and depend upon us for the accomplishment of their varied requirements. We engage in ethical business dealings only. In future, we wish to maintain our astounding testimony of triumph.